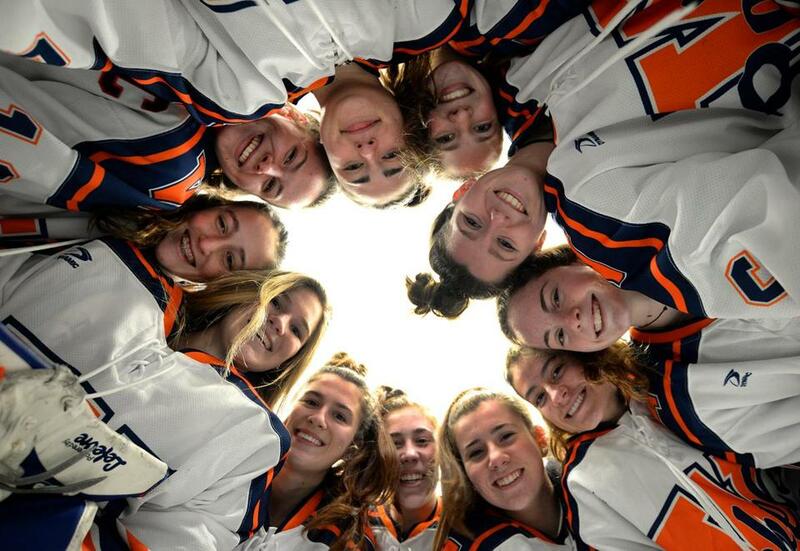 The Walpole high sisters of hockey: (Clockwise, at 12 o&apos;clock) Elizabeth Desimone, Emma McInerney, Meghan Hamilton, Jamie Ryan, Jess Tosone, Jenna Malone, Olivia Malone, Audra Tosone, Kiera McInerney, Emily Desimone, and Madison Ryan. Missing is Kiley Hamilton, who was sick. WALPOLE — Since his arrival 11 years ago, Walpole High girls’ hockey coach Joe Verderber has strived to create a family culture. Perhaps it was only natural. Verderber’s father, Ted, has served as an assistant coach since the beginning of his son’s tenure with the Rebels. But this season, with six pairs of sisters — including one set of twins — making up more than half of the Rebels roster, it’s more than a mantra. At 6-1, the Rebels are off to their best start since the 2010-11 season. However, sophomore twins Emily and Elizabeth Desimone are quick to laugh off any mention of twin telepathy. Their teammates agree that team success has little to do with a sister connection but is more about talent and depth. Since a 2-1 loss to Needham Dec. 19, Walpole has rattled off four wins, including an 8-0 rout of Milton. In a 5-1 Bay State Conference win over Weymouth last week, senior captain Audra Tosone netted a hat trick and Meghan Hamilton tallied four assists. Senior captainOlivia Malone added a goal and two assists. The Hamiltons and Desimones are two of the six sets of sisters, alongside Malone and her sister, Jenna, a junior, and senior Kiera McInerney and her sibling Emma. Emily Desimone returns to the second line, while Elizabeth works in the defensive end. Kiera McInerney splits time in net with senior Cam Murphy, while Emma prowls the offense for the Rebels,. The elder Hamilton skates on a first line alongside fellow seniors Tosone and Malone. Freshman Jess Tosone is working her way back from a field hockey injury and will slip into the forward rotation, and Jenna Malone is a solid defender. Audra Tosone and senior Madison Ryan are welcoming the opportunity to skate alongside their younger sisters, who are freshmen, after spending the majority of their careers split by different age brackets in youth hockey. Jess Tosone and Jamie Ryan agreed that having their sisters on the roster made the transition to high school hockey easier, while the elder Ryan admitted the feeling was mutual. The Ryan sisters have often skated as the Rebels’ top defensive pairing. This familiarity, only tightened by the multitude of familial ties, is a major strength of the Rebels program, according to Verderber. The benefits of having a sister out on the ice vary from pair to pair. A sister is a friendly face, a source of encouragement, a top competitor. But when there are 12 of them all vying together for the program’s first Bay State Conference Herget title since 2012-13 and a trip to the Garden in March? Framingham is winless through six games, but thus far it’s been a proud homecoming for first-year coach Casey Diana. There were a few friendly faces on the current Flyer roster for Diana. When she was a player, she helped out with the Framingham Youth Hockey program, coaching several of her current players, including senior Caroline Stacey and junior Georgia Parker . Diana played collegiately at Franklin Pierce University, where she appeared in 41 games across four seasons as a defender for the Ravens. After graduating in 2017, Diana returned to Framingham as a volunteer assistant before taking over the program this year. ■ Matignon senior captain Carolyn Mahoney recorded her 100th career point last weekend in a 4-0 win over Leominster. As a four-year varsity player, Mahoney has been the driving force behind the Warriors’ rebuilding effort this season. In Mahoney’s freshman season, the Warriors advanced to the state semifinals before falling to eventual Division 2 champion Notre Dame-Hingham. With varied success since, Mahoney now leads a young undersized Warriors team with only 14 skaters. Wednesday, St. Mary’s at Peabody (at McVann/O’Keefe Rink. 5:15 p.m.) — Is Peabody strong enough to take down third-ranked St. Mary’s, or will the host Spartans give the Tanners a reality check? Saturday, Needham at Braintree (at Zapustas Rink, 5:30 p.m.) — The Rockets are stating their case for the best team in the Bay State Conference. So are the Wamps. Saturday, Westwood at Canton (Canton IceHouse, 6 p.m.) — The first meeting went heavily in favor of Westwood (5-1 on Dec. 29). But the Bulldogs are looking to break out of a funk against their rinkmates. Saturday, St. Mary’s at Austin Prep (at Essex Sports Center, 6 p.m.) — Austin Prep freshman Aylah Cioffi takes on her former team for the first time in a battle of top-three teams. Monday, Austin Prep at Westwood (at Canton IceHouse, 5 p.m.) — The top-ranked Cougars hit the road against the top team in the South. An intriguing matchup. Monday, Notre Dame (Hingham) at Walpole (at Rodman Arena, 6:30 p.m.) — NDA believes it deserves to be in the conversation as a legit title contender in Division 2. A win at Walpole may help make their case. Correspondent Dan Shulman also contributed. He can be reached at dan.shulman@ globe.com. Jenna Ciccotelli can be reached at jenna.ciccotelli@ globe.com.